Want your King Tiger unpainted or without gearboxes or electronics? Want to assemble it yourself? Then our King Tiger kit is your perfect option! King Tiger metal lower chassis with torsion bar suspension system and metal suspension arms. Also includes metal tow hooks, our easy open latch system, and metal exhausts. King Tiger metal drive and idler wheel set. Our idlers include bearings for super smooth operation. King Tiger metal road wheel set with bearings. King Tiger metal closed pin track set. Airsoft upper hull and turret prewired with metal hatches and accessories. This kit will come unassembled and will require some very basic skills to put together. This kit will also come unpainted and without a smoke unit, motherboard, speaker, or transmitter. This model also does not come with gearboxes, you can find the correct gearboxes for this model HERE. Attention: This tank is offered in an airsoft only variant. This tank does NOT come with all the components to make this tank operational! You will need a motherboard and transmitter at the minimum to operate this tank. 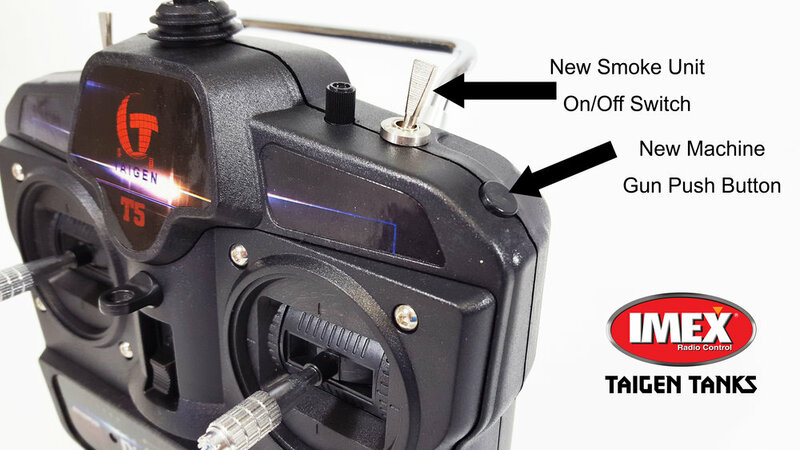 You can use the Taigen system or you can use an aftermarket system like the IBU series boards. If you wish to use the Taigen system you can purchase them on this page or in our electronics section. Please feel free to use the CONTACT US or TECH SUPPORT pages with any questions you may have before purchase, we are always happy to help! For a fully functioning model you will need to make sure your tank has at least these components: a power cable (with your battery connector end whether it be Deans/T-Plug or the normal Tamiya plug style), a 2.4ghz wiring kit, motherboard (which has the receiver built in), transmitter, and smoke unit. Please also check if your kit comes with gearboxes, so do and some do not. Once again please feel free to contact us with any questions you may have! We offer a 360 degree rotation upgrade kit for this King Tiger kit which is already included with this kit. The rotation kit is plug and play for this kit and is included but not installed on this tank.